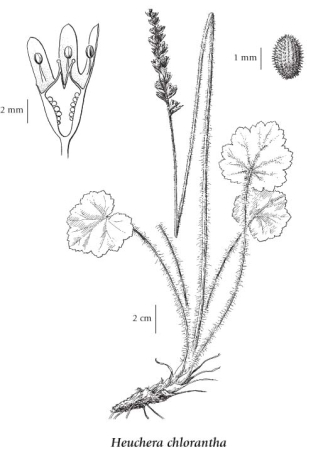 Perennial herb from short, thick rhizomes; stems erect, 40-100 cm tall, conspicuously long-soft-hairy below, glandular-hairy above. Basal leaves heart-egg- to almost kidney-shaped, 4-8 cm wide, not quite as long, palmately 5- to 9-lobed, the lobes shallow, broadly rounded, doubly-toothed; long-stalked, the stalks densely hairy; stem leaves lacking; stipules membranous, fused to the leaf stalks. Inflorescence spike-like, densely-flowered, to 15 cm long; bracts membranous; petals white to greenish-yellow, often absent or partly absent, clawed, less than half length of sepals, the blades linear to broadly spoon-shaped; calyces green to greenish-yellow, narrowly bell-shaped, joined to ovary almost to top, the free hypanthium slightly lop-sided, about as long as part joined to ovary, lined with a thick glandular disk, calyx lobes 5, nearly equal, oblong, about as long as rest of calyx, tips blunt to rounded; stamens 5, opposite the calyx lobes. Capsules, 9-11 mm long, opening along the beaks; seeds dark brown, 0.7-0.8 mm long, with lengthwise rows of slender spines. Mesic to moist grassy bluffs, streambanks, meadows, rocky river banks, roadsides and forest margins in the lowland and montane zones; infrequent on the Queen Charlotte Islands, WC BC, S Vancouver Island and the adjacent mainland; S to ID and CA.